Dulces Vero is the largest hard candy and other sugar candy confectionary products in Mexico. It was founded over 50 years ago in Guadalajara, Jalisco Mexico by Angel Ibarra Davila. The company is vertically integrated with 20 different plants, manufactures over 300 sku's and employs 5,000 persons. Paletas de caramelo macizo acidulada y enchilada sabor a sandia. "Grupo Dulces Vero" est� constituido por mas de 20 empresas, incluyendo f�bricas, distribuidoras, imprenta y empresas de auto transporte y servicios; da empleo a m�s de 5,000 personas y ofrece a sus consumidores una variedad de m�s de 300 productos. I love these lollipops. They start hot and spicy at first and then you can slowly start to taste the watermelon sweetness afterwards and before you know it it's completely sweet! ConsSometimes the outer layer of spicy and hot melts and becomes gooey but it's still delicious as hell in that condition. You start off with a sour and spicy coating but you work yourself the middle and then it's coasting all the way with sweet. My friend would bring me some back from mexico back in high school. ProsIt's sweet, sour and spicy. ConsEating more than one might damage your tongue and the roof of your mouth, ouch. An amazing blend of sweet and spicy, the flavors work so well together you'll find yourself having trouble putting them down. It's not hard to go through a whole bag of these little wonders in a short amount of time -- even if it makes the ol' tongue a bit sore. ConsA bit rough on the tongue, rough surfaces on something you lick can get a bit irritating. I love this candy, it have a perfect gaste betwen de spicy ad the sweetness. I buy this candy again and again. I love it. The spiciness and sweetness are perfect together. My favorite candy! 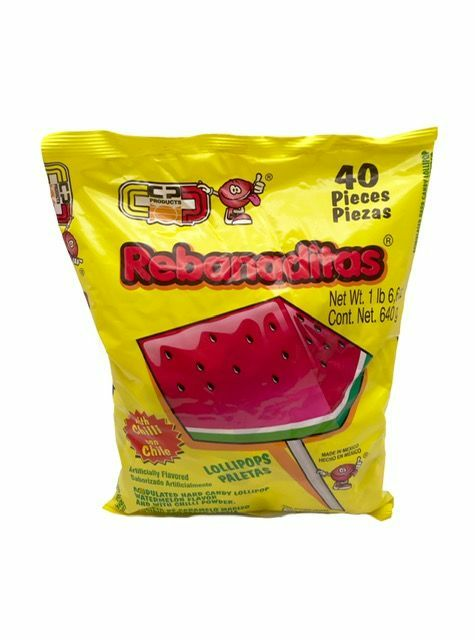 Mexgrocer offers the best deals on Mexican candy and I have shopped around. My co-worker swore on these and I could not imagine the taste. At first I found it kind of gross but after the first one, I have been addicted to them since. I already ordered one bag and have introduced them to several friends who also have ordered. LOVE THEM ! My fiance LOVES these lollipops. So whenever a holiday comes around I make sure to order him a bag! They are great! I moved to another state, and they dont see this here and I absolutely LOVE this product, and Im so glad to kno that I can buy it whenever I want, now! YUMMY!! Excellent blend of sweet, spicy and sour! Loved them. Product was fresh and they arrived in a timely manner. Will order again when I need to. This was verry good i like the spice mix with the sweetness of the watermelon. Absolutely love these suckers! Great mixture of sweet, sour and spicy. this is great, it's my favorite since i was little. It is a spicy lollipop! great, it's spicy but not too spicy in the beginning, then it's half spicy half sweet, the completly sweet. (: its great!